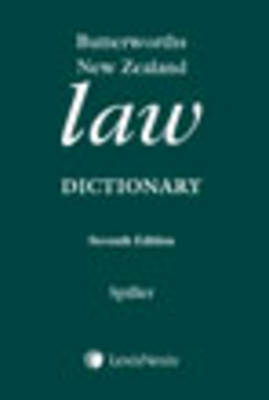 The New Zealand Law Dictionary is designed to provide a basic understanding of the terms that are used in New Zealand law. The Dictionary provides, where possible, statutory and other legal references to illustrate the ways in which the defined terms are used in New Zealand law. ... read full description below. The New Zealand Law Dictionary is designed to provide a basic understanding of the terms that are used in New Zealand law. The Dictionary provides, where possible, statutory and other legal references to illustrate the ways in which the defined terms are used in New Zealand law. The vast majority of the terms in the Dictionary are English, but the Dictionary also includes words in languages such as Latin, French and Maori which are used in New Zealand law. In this edition I have taken account of amendments in the law from 1 October 2005 to 1 September 2011, particularly through legislation. These changes have introduced new terms and concepts into New Zealand law. As a result, there are around 200 new entries, taking the total number to over 5000. At the same time, I have continued my policy of strengthening shorter entries with New Zealand legal references, and removing unnecessary detail in longer entries. The overall result is that the Dictionary has been increased in length only slightly. Over the past six years, New Zealand law has been modified in significant respects. There have been seven areas in particular where legal changes have affected this edition. First, providers of services (including lawyers, conveyancers and real estate agents) have been affected by statutes specifically designed to protect consumers and enhance professional responsibility. Secondly, several institutions (including the police, coroners and immigration authorities) have been reorganised with a view to improving their administration and efficiency. Thirdly, steps have been taken to improve the accessibility and effectiveness of the administration of justice, for example through new District and High Court Rules and legislation affecting the law of evidence and criminal justice. Fourthly, advances in technology have been reflected in legislation regulating diverse areas such as electronic messages and human tissue. Fifthly, the statute law affecting important areas of substantive law (such as wills, real and personal property) has been modernised, restated and reformed. Sixthly, measures have been adopted to enhance the protection of and access to the environment through for example waste minimisation and clarification of access to marine and coastal areas. Finally, New Zealand has continued to ensure that its international obligations have been met in areas such as sports anti-doping and cross-border insolvency.